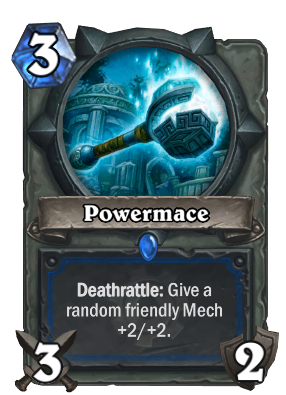 Honestly, has anyone ever seen a Mech Shaman deck before? Seriously... i'm asking. This used to be used in Aggro Shaman back in the day with Whirling Zap-o-matic. I don't think I've seen anyone go full out mech Shaman though. Is this card worth using in a deck without mechs? of course not.. It's a 3 mana 3/2 weapon. A 3-mana 3/2 weapon is not unplayable in the slightest. Eaglehorn Bow saw play in Hunter without Secrets. This card is such a nice combo with Arcane Nullifier X-21. It has won me a few games already with my tempo-midrange deck. I would gladly pay 3 for a Fiery War Axe without an ability. This combos well with your Mechanical Yeti on turn 4. Apparently, the dev's thought Arcane Nullifier X-21 was the best combo with this card, and unless you're up against something like Loatheb, it's effectively better than buffing Spider Tank or Mechanical Yeti. Relevant comment in 2017. Sounds like most people would, in fact, not gladly pay 3 mana for Fiery War Axe. This looks alot like aurastone hammer. This is gonna be amazing with mechanical yeti or coined out with spidertank. Yep. Spider Tank, Harvest Golem, Mechanical Yeti -> nice synergy. Nice.. no overload as well which is surprising. Great card!